Silver Oaks DLF Gurgaon, India. The terms used to denote the various components of ‘carbohydrates’ have evolved over centuries with definitions frequently being broadened to encompass a greater meaning or narrowed for greater precision. The maneuverings of biochemists and nutritionists are often beyond the reach of medical professionals and people who do not have professional knowledge of the subject. Consequently, every term holds different meanings for different people and leads to much confusion. Like terms of endearments, scientific terms regarding food are much beloved and hold a strong and lasting grip over popular imagination. Scientists and the food industry have, as a result, found it difficult to phase out terms they think are obsolete. And yet this exercise is necessary for practical eating especially in the case of patients with diabetes, obesity and heart disease. The way out is to coin a fresh term: Glucogenic-carbohydrates, one that has no preconceived notion attached to it. Carbohydrate, Available carbohydrate, Carbohydrate by difference, Fructose, Starch, Sugar, Blood sugar, Honey, ADA (American Diabetes Association), Lancet, Calories, Fibre, Diabetes, Heart disease, Obesity, Practical eating. That ‘carbohydrates’ played an important role in diabetes was known to the Indian physician Sushruta who, identified it in the sixth century BCE as madhu-meha or sweet-urine, made the connection with rice (grain) and prescribed a reduced intake and an increase in exercise . The water drained off after cooking rice has been in use to stiffen lengths of fabric draped by women or worn as turbans since ancient times. The English word ‘starch’ dates from the late fourteenth century Mercian word ‘stercan’, West Saxon ‘stiercan’ and proto German ‘starkjan’ meaning to make rigid or hard . By the mid-fifteenth century, Europeans were using a wheat extract to stiffen their shirts. Sugarcane, offered to the gods of India during Vedic sacrifices, was made known to the western world by Alexander-the- Great’. The ancient names: Sanskrit-shakkara, Arabic- sukkar, Greek-sacchari, and Latin-saccharum live on. By the early seventh century CE, the technology of making crystal or table sugar was exported from India to China as collaboration between the two emperors . That sugar was a plant produce was obvious: be it sugarcane extract, honey, beet sugar or fruit sugar. But what of sugar in the urine? The fact wasn’t recognized in Europe until the seventeenth century. Thomas Willis (1621-75) was the first to discover the sweetness of a diabetic’s urine. That it was due to sugar, had to wait until the eighteenth century when Mathew Dobson (1735-84) noted that the patient’s blood serum was ‘sweetish’ but not as sweet as the urine. The colorless urine when evaporated left behind a white substance that could not ‘by taste be distinguished from sugar’. Could the human body be generating the sugar? Could animals like plants, manufacture sugar? John Rollo thought it was formed from plant produce, rich in starch and mucilage, in the stomach. The solution then was to eliminate all vegetables and keep his patients on a regimen of animal produce and bread. He documented the regimen in An Account of Two Cases of Diabetes Mellitus published in 1797 . Rollo’s treatment remained popular until the discovery of insulin. In the early nineteenth century, individual sugars were often named after their source, e.g. grape sugar or cane sugar. A consensus was reached that sugars should be named with the ending '-ose', and in 1838, Dumas coined the term ‘glucose’ (Greek gleukos or sweet wine) for the sugar obtained from honey, grapes and starch. In 1840, Anselme Payen coined the term cellulose from the French word ‘cellule’ for cell. The structure was discovered much later. This ‘carbohydrate’ can be digested by herbivores but not humans. In 1855, Claude Bernard isolated and coined the term ‘glycogen’ for the starch like substance stored in the livers of mammals, one that was made up of glucose drawn from the blood and could be broken down back into glucose whenever the body needed it . To Claude Bernard must go the credit of pinpointing that it is glucose and not sugar (sucrose) that is present in blood. Hundred-and-sixty-three years later we continue to loosely use the term ‘blood sugar’ [6,7]. In 1857, William Miller coined the term ‘sucrose’ for common table sugar extracted from sugarcane or beet. It wasn’t until 1858, that the molecular formula of Dumas’ glucose C6H12O6 was established and subsequently shown to be a hexose. It was around this time that the term 'carbohydrate' (French 'hydrate de carbone') was coined especially for the glucose like monosaccharaides, whose empirical composition could be expressed as Cn(H2O)n. The term has grown since then to become an all-inclusive word for the ‘kingdom of carbohydrates’ listed by the biochemists and the nutritionists. In 1866, Kekulé proposed the name dextrose for dextrorotatory glucose. Fruit sugar obtained from hydrolysis of cane sugar (sucrose=glucose+fructose) was levorotatory and for a while called ‘laevulose’. Between 1880-90, Emil Fishcher began to work on the relative configurations of most known sugars. Many new sugars were synthesized in the process necessitating the creation of new names. With his colleagues, he laid the foundations of a terminology that continues to be in use: triose, tetrose, pentose, and hexose. He approved of Armstrong's proposal to classify sugars into aldoses and ketoses, and proposed the name fructose for laevulose, as optical rotation was not a suitable criterion for grouping sugars into families. In 1893, Charles Reid established the biological process of the synthesis of complex carbon compounds out of carbonic acid, in the presence of chlorophyll, under the influence of light and Charles Barnes coined the term ‘photosynthesis’ . • How do plants create ‘carbohydrates’ and use it as food? The water soluble glucose produced by the Calvin-cycle can be easily accessed through the xylem and phloem channels in the stems. • How do they store these ‘carbohydrates’ for use later? A) Fructose is stored in fruit B) starches (amylose and amylopectin) made of thousands of glucose molecules are stored in roots (potatoes, carrots, yams) and in seeds (rice, wheat, legumes, millets etc.) to feed the plant embryo. C) cellulose (fiber for humans) is a part of the cell walls of plants giving them their structure and holding them upright . • The animal kingdom cannot photosynthesize and therefore cannot manufacture their own food or ‘carbohydrates’. Lactose is the only sugar produced by female mammals. Lactating carnivores suckle their young and manage to produce lactose without any help from plant food . Up to the 1940s, nomenclature proposals were made by individuals. The scientific community sometimes accepted these names. It is a generic term which includes monosaccharides, oligosaccharides and polysaccharides as well as substances derived from monosaccharides. The ancient word has remained in constant use. The all-inclusive term continues to be in use since 1858, without differentiating between the calorigenic/glucogenic portion and the portion that is excreted unchanged. Since the early 1900s, the protein, fat, ash and moisture content of a food were determined, subtracted from the total weight of the food and the remainder, or "difference", considered to be carbohydrate. This term includes all ‘carbohydrates’ in food ingredients including fiber . In 1953, Hipsley coined the term . In 1972, Trowell defined ‘this as a healthy component’ or cell walls of plants which is digested very poorly by human beings . The main components comprise cellulose, hemicellulose and pectin (the non-starch polysaccharides), gums and mucilages. There is currently no consensus as to whether other components e.g. lignin, should be included in this term. Its widespread use and popularity with the consumer and product development has made it difficult to phase the term out. In 1977, the McGovern report, ‘Dietary Goals for the United States’ used the term ‘complex-carbohydrate’ to encourage consumption of what were considered to be healthy whole foods such as whole-grain cereals, fruit and vegetables. In time it has come to describe either starch alone, oligosaccharides and polysaccharides , the combination of all polysaccharides [14,19], cereals [20,21], low glycemic index/low glycemic load foods , and slowly digestible ‘carbohydrates’ . ‘Refined-carbohydrate’ was coined to encourage reduced intake of refined or processed sugar and later refined or processed grains . Coined in 1982, it is now defined as that fraction of dietary starch, which escapes digestion in the small intestine . In 1989, a United Kingdom (UK) Department of Health committee introduced the terms for added sugar used as sweetener vs sugars occurring within the cell walls of plants, i.e. naturally occurring and supposedly the healthier option . But the mental connection with white refined table sugar made it too confusing. The terms never became popular. The term was introduced in 1989 to represent monosaccharides and disaccharides . The fallacy is that mono and disaccharides in the pure form do not exist in nature. Food ingredients like sprouting grains or malted cereals will contain other components from the ‘kingdom of carbohydrates’ besides the simple sugar ‘maltose’ identified with them. Cellulose, hemicellulose and lignin-are not soluble in water whereas pectins, gums and mucilages-become gummy in water . Some of soluble fibers had some effect on glucose and lipid absorption from the small intestine. In 2018, it was found that fiber (the insoluble part), hitherto considered completely indigestible was slowly and incompletely fermented in the large intestine by gut bacteria, producing short chain fatty acids which contributed to energy . In 1997, Food and Agriculture Organization/World Health Organization Expert Consultation used the term totalcarbohydrates. Here the direct measurement of the individual components are derived and then combined to give a total . Essentially, it is a new method of deriving the century old carbohydrate-by-difference. In 2015, Food and Drug Administration (FDA) defined sugars as, ‘the sum of all free mono and disaccharides’ which would include glucose, fructose, galactose, lactose and sucrose and maltose . In 2016, the nutrition labelling requirements were revised and total sugars needed to be included as a part of totalcarbohydrates . In 2015, the UK Scientific Advisory Committee on Nutrition recommended the adoption of the term which includes: all sugars naturally present in fruit and vegetable juices, purées and pastes and similar products in which the structure has been broken down; all sugars in drinks (except for dairy-based drinks); and lactose and galactose added as ingredients. The sugars naturally present in milk and dairy products, fresh and most types of processed fruit and vegetables and in cereal grains, nuts and seeds are excluded from the definition . The term was also adopted by WHO that year . In 2016, FDA defined the term as ‘sugars [that] are either added during the processing of foods, or are packaged as such.’ It differentiated it from added refined starches used for thickening . Recommended Dietary Allowance (RDA) for nutrient intake is determined by the Institute of Medicine's Food and Nutrition Board. The minimum amount of ‘carbohydrate’ recommended is 130 g per day. This recommendation is based on the amount of glucose required to maintain the needs of the Central Nervous System (CNS) . Intermittent fasting lasting for more than 24 h has been ritually practised in India until two generations ago, in accordance with the dietary law given in Manusmriti (the laws of Manu) . Nearly every culture practises this in some form. It has been used to treat epilepsy since at least 500 BC and was reintroduced once again in the 1920s. After two decades of use it gave way to new antiepileptic drugs. In 1921, Wilder reporting on patients treated with the ketone‐producing diet at the Mayo Clinic, coined the term “ketogenic diet.” Subsequently, Peterman at the Mayo Clinic reported the calculation of KD similar to that used today: 1 g of protein per kilogram of body weight in children, 10–15 g of ‘ ‘carbohydrates’ per day, and the remainder of the calories in fat . Interest in ketogenic diets sparked once again in 1995 after being featured on a popular TV program . A Very-Low-Carbohydrate Ketogenic Diet (VLCKD) generally contains<50 g and often as few as 20 g of totalcarbohydrate per day. At this point, ketosis occurs, wherein ketones can be measured in the urine or blood and may also be smelled on the breath. Nutritional ketosis should not be confused with diabetic ketoacidosis, an extremely dangerous condition characterized by severe hyperglycemia and excessive production of ketone bodies caused by inadequate insulin and resulting in electrolyte imbalances, profound dehydration, and a markedly acidic pH [35,38]. The diet has since been used for to treat obesity, diabetes, gliomas  and intractable epilepsy. Though in practical use since John Rollo’s time, the term lowcarbohydrate came into use in medical journals since 1966 [40,41,42]. It is not used by Dr. Atkins in his book Atkins Diet Revolution published in 1972. He refers to grams of ‘carbohydrates’ to be eaten in a day beginning with zero to sixty grams in the first phase. Defining low-carbohydrate diets is difficult because there is no consistent definition. In a recently published systematic review of macronutrients published by the ADA, definitions for verylow- carbohydrate diet (21-70 g/day) and moderately lowcarbohydrate (30 to<40% of calories) were suggested. These definitions were proposed to evaluate the research to date on ‘carbohydrate’ intake and glycemic control and are not considered all-inclusive, but rather are representative of definitions used by authors conducting research in this area . A more moderately restricted, nutrient-dense ‘carbohydrate’ meal plan contains 20-25% of energy as total-carbohydrate (100-125 g in a 2,000-calorie meal plan), 20%-30% as protein, and 45%-60% as total fat . In this context a diet that gives the RDA of ‘carbohydrate’ in a day falls in the range of the high-carbohydrate diets. The term was used in a research study in 1966, where 85 percent of calories came from ‘carbohydrates’ . This, however, was not the norm. In the 1970s, responding to the rising rates of heart disease among Americans, the federal government recommended a low-fat, high-carbohydrate diet. That decision led to the first dietary guidelines, called Dietary Goals, published in 1977, which defined a healthy diet: 1) intake of ‘carbohydrates’ to be 55 to 60 percent of daily calories (i.e. 275 to 300 g for a 2000 calorie diet) 2) saturated fats to be limited to 10 percent of daily calories . Subsequently a high-carbohydrate diet was defined as greater than 65% of the calorie intake . The Lancet’s PURE study now finds increased mortality and morbidity associated with an intake greater than 60% . This 300 g per day for a 2000 calorie diet should then be the upper range of highcarbohydrate diets. In this context the RDA for ‘carbohydrates’ falls far below the high-carbohydrate diet range and yet well above the moderate-carbohydrate diet range. Unfortunately, patients are used to eating according to their appetites and habits which do not always correlate with their activity levels. In case the patient has been advised a lower calorie intake, there is a concomitant drop in protein and fatthe two other macronutrients that contribute to calories and important factors in satiety, and in fibre, when suitable ‘carbohydrate’ choices are not being made. The resultant hunger pangs lead to non-compliance. Patients, who have been given weights/volumes of cooked foods, do not connect the weights of raw ingredients with cooked volumes or other nutrients that have been factored in. They will re proportion their volumes of foods, especially ‘carbohydrate’ foods and can unknowingly increase from say the prescribed 135 g to 168.7 g. Technically they continue to remain within the prescribed 45% of calories from ‘carbohydrates’ though they have jumped from the 1200 to 1500 calories a day bracket. This confuses the prescribers as no one wants patients to go hungry. The correction advised will be to then increase the activity level which is as difficult to comply with. More often than not, this goes undeclared and the prescribers’ calculations do not achieve the desired results. nutrients that have been factored in. They will re proportion their volumes of foods, especially ‘carbohydrate’ foods and can unknowingly increase from say the prescribed 135 g to 168.7 g. Technically they continue to remain within the prescribed 45% of calories from ‘carbohydrates’ though they have jumped from the 1200 to 1500 calories a day bracket. This confuses the prescribers as no one wants patients to go hungry. The correction advised will be to then increase the activity level which is as difficult to comply with. More often than not, this goes undeclared and the prescribers’ calculations do not achieve the desired results. In countries which lack good labelling practices i.e. a nutrition label that explain the grams of nutrients in the contents of the package being sold, prescribing diets becomes all the more difficult. Prescribing exact weights of all raw ingredients to be eaten in a day accompanied by the analysis of the ‘carbohydrates’, proteins and fats contained within, makes it easier for patients to follow. Patients, experienced in cooking, can then use the raw ingredients allowed for the day to cook the food of their choice, which is a liberating experience. It is no longer an abstract thought but a visible tangible intervention. For those not so experienced, menus-for-the-day can be drawn up using the day’s ingredients. This need has been felt and calls for the explicit usage of terms and numerical recommendations have been made . Regardless of the progress in nomenclature the world of nutrition has clung to the beloved old terms and so ADA (American Diabetes Association) in its 2010 Dietary Guidelines stated: ‘Carbohydrate’ is the main nutrient that raises blood glucose levels. The amount consumed has a greater impact than the type of ‘carbohydrate’. It suggested a ‘carbohydrate’ intake of 45%-65% of daily calories in which sugars and sweets could be made to fit into the eating plan . The intake of ‘carbohydrate’ has become greater than 60% of the day’s energy intake leading to a rising prevalence of prediabetes and diabetes amongst the rich and poor and an adverse impact on total mortality and non-cardiovascular disease mortality and stroke, documented The Lancet . The use of the generic term ‘carbohydrate’ causes confusion among prescribers and patients. The ‘carbohydrate’ in a food ingredient e.g. an apple, consists of all the components listed in the sections above, and covers quite literally the entire ‘kingdom of carbohydrates’, including both total sugar and fiber. All components except the fiber will be digested fully and metabolized into calories. Of the fiber portion, a fraction will be digested by the gut bacteria into fatty acids i.e. a source of calories. The rest of the fiber will be excreted and will not be metabolized to glucose or calories. The word ‘carbohydrate’ is used loosely though subconsciously the scientists are aware that they are referring to the energy giving portion of ‘carbohydrate’ [47-58] the portion to which insulin will respond , the portion that will be stored in the liver . Some refer to ‘carbohydrates’, sugar and fiber as individual nutrients [61,62]. It is time to coin a new term for practical eating: ‘Carbohydrate’ – fiber = Glucogenic-Carbohydrates. This is a good term for it has never been used before and is therefore free of all preconceived notions. When expressed in grams to be consumed in a day, it makes it easier for practitioners to prescribe weights of raw plant produce and for patients to comprehend the instructions. The alternative term ‘monosaccharidogenic-carbohydrates’, though more precise, will not be accepted easily by the world of patients and prescribers. Thus, ADA should recommend a Glucogenic-Carbohydrate intake of 130 (RDA) to 325 (65% of 2,000 calorie diet) g a day instead of 45%–65% of the day’s energy intake (Figure 1). Figure 1:‘Carbohydrates’, Glucogenic-Carbohydrates, fiber that is fermented, and fiber that is excreted. The Lancet should warn against an intake of Glucogenic- Carbohydrates greater than 180 (60% of 1200 calorie diet) or 300 (60% of 2,000 calorie diet) g a day instead of 60% of the day’s energy intake. Carbohydrate-by-difference is the ADA’s and The Lancet’s ‘carbohydrate’. The sugars-total will all be digested and metabolized, via the glucose route to calories, as will the rest of the components barring the fiber-total-dietary. The fraction of calorigenic-fiber has to be ignored for it does not raise blood glucose levels. It is fiber that forms the bulk of a large section of plant produce and is an important factor in satiety. Since there is a large variance in the quantity of grams of fiber per 100 g of raw produce, it is possible to arrange the vegetables, fruits and grains in ascending order of grams of Glucogenic- Carbohydrates (Figure 2). 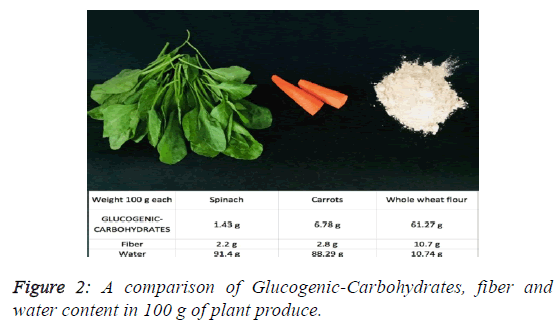 Figure 2: A comparison of Glucogenic-Carbohydrates, fiber and water content in 100 g of plant produce. Priestley in 1924, records in The First Sugar of Photosynthesis that ‘sugar’ is formed in green leaves. It is then transported elsewhere for storage. Consequently, most green leaves  coriander and mint leaves, spinach, turnip greens, collard greens, mustard greens, accompanied by bitter gourd, cucumbers, egg plants, green capsicum, mushrooms etc. occupy the lowest Glucogenic-Carbohydrate space. The colored root vegetables including potatoes and yams occupy the next higher rung. Fruits, whether ripe or unripe, go a step higher. Last of all, at the very top, come the seeds: cereals, grains and legumes. Those lower in Glucogenic-Carbohydrate should be eaten in greater amounts for satiety and should form the staple food of the diet. Starch: Origin and meaning of starch by Online Etymology Dictionary. Jorgens V, Grusser M. Happy Birthday Claude Bernard. Diabetes. 2013;62: 2181-82. Huhmann MB, Yamamoto S, Neutel JM, et al. Very high-protein and low-carbohydrate enteral nutrition formula and plasma glucose control in adults with type 2 diabetes mellitus: A randomized crossover trial. Nutr Diabetes. 2018; 30:45. Kuhtreiber WM, Tran L, Kim T, et al. Long-term reduction in hyperglycemia in advanced type 1 diabetes: The value of induced aerobic glycolysis with BCG vaccinations. npj Vaccines. 2018;3:23. Gest H. History of the word photosynthesis and evolution of its definition. Kluwer Academic Publishers. 2002 ;73:7-10. Hedberg GE, Derocher AE, Andersen M, et al. Milk composition in free ranging polar bears (Ursus maritimus) as a model for captive rearing milk formula. Zoo Biol. 2011; 30:550-65. IUPAC Commission on the Nomenclature of Organic Chemistry (CNOC) and IUPAC-IUB Commission on Biochemical Nomenclature (CBN). Tentative rules for carbohydrate nomenclature. Biochem J. 1972;126:1057.b2. International Union of Biochemistry and Molecular Biology, Biochemical Nomenclature and Related Documents. Portland Press, London (1992). McNaught AD. Nomenclature of carbohydrates (Recommendations 1996). Adv Carbohydr Chem Biochem. 1997: 52:43-177. Chapter 1-The role of carbohydrates in nutrition. Fao.org. Kayode J, Sola A, Adelani A, et al. The role of carbohydrate in diabetic nutrition: A review. Internet J Lab Med. 2008;3. Dhingra D, Michael M, Rajput H, et al. Dietary fibre in foods: a review. J Food Sci Technol. 2012; 49: 255-66. Trowell H. Ischemic heart disease and dietary fiber. Am J Clini Nutr. 1972; 25: 926–32. Singh U, Kocchhar A, Singh S. Carbohydrates: Their Effect in Human Health. Proc Indian Natn Sci Acad. 2010;76:81-7. Griel AE, Ruder EH, Kris-Etherton M. The changing roles of dietary carbohydrates from simple to complex. Arterioscler Thromb Vasc Biol. 2006; 26:1958–65. Ferreti F, Marlani M. Simple vs complex carbohydrate dietary patterns and the global overweight and obesity pandemic. Int J Environ Res Public Health. 2017;14: 1174. Topping D. Cereal complex carbohydrates and their contribution to human health. J Cereal Sci. 2007;46:220-29. Pharr JR. Carbohydrate consumption and fatigue: A review. Nevada J Public Health. 2010;7:6. Yu D, Shu XO, Li H, et al. Dietary carbohydrates, refined grains, glycemic load, and risk of coronary heart disease in Chinese adults. Am J Epidemiol. 2013;178:1542-49. Sajilata MG, Singhal RS, Kulkarni. Resistant starch a review. Comprehensive reviews in food science and food safety. 2006; 5:1-17. National Research Council (US) Committee on Diet and Health. Diet and Health: Implications for reducing chronic disease risk.National Academies Press (US).1989. British Nutrition Foundation. Dietary Fibre. BNF Newsletter. 2007. Erickson J, Slavin J. Total, added, and free sugars: Are restrictive guidelines science-based or achievable? Nutrients. 2015; 7: 2866-78. Food and Drug. FDA Issues Final Rules on Changes to Nutrition Labels. Covington. 2016. Swan GE, Owell NA, Knowles BL, et al. A definition of free sugars for the UK. Public Health Nutr. 2018;21:1636-38. Health.gov. Dietary guidelines for Americans 2015-2020 Eighth Edition. USDA. Institute of Medicine: dietary reference intakes: energy, carbohydrate, fiber, fat, fatty acids, cholesterol, protein, and amino acids. Washington, DC, National Academies Press, 2002. Spritzier F. A low-carbohydrate, whole-foods approach to managing diabetes and prediabetes. Diabetes Spectrum. 2012;25:238-43. Wheless JW. History of the ketogenic diet. Epilepsia. 2008;49:3-5. Phillips RH, Bunnell A. The “new” Ketogenic Diet. Acad Nutr Diet. 1995;95:A59. Wheeler ML, Dunbar SA, Jaacks LM, et al. Macronutrients, food groups, and eating patterns in the management of diabetes. Diabetes Care. 2012;25:434–45. Martin-McGill KJ, Srikandarajah N, Marson AG, et al. The role of ketogenic diets in the therapeutic management of adult and paediatric gliomas: A systematic review. CNS Oncology. 2018 ;7:2. Farquhar JW, Frank A, Gross RC, et al. Glucose, Insulin, and Triglyceride Response to High and Low Carbohydrate Diets in Man. J Clin Invest. 1966;45:10. Stock AL, Yudkin J. Nutrient intake of subjects on low carbohydrate diets used in the treatment of obesity. Am J Clin Nutr. 1970;23:948-52. Dyson P. Low carbohydrate diets and type 2 diabetes: What is the latest evidence? Diabetes Ther. 2015;6:411-24. Experience Life Team. Digesting the New USDA Dietary Guidelines. Experience Life. 2011. Dehghan M, Mente A, Zhang X, et al. Associations of fats and carbohydrate intake with cardiovascular disease and mortality in 18 countries from five continents (PURE): A prospective cohort study. Lancet. 2017;390:2050-2062. Warshaw HS. Diabetes meal planning made easy. American Diabetes Association. 2010. Siri-Tarino PW, Chiu S, Bergeron N, et al. Saturated fats versus polyunsaturated fats versus carbohydrates for cardiovascular disease prevention and treatment. Annu Rev Nutr. 2015;35:517-43. Praagman J, Beulens JW, Alssema M, et al. The association between dietary saturated fatty acids and ischemic heart disease depends on the type and source of fatty acid in the European Prospective Investigation into cancer and nutrition-Netherlands cohort. Am J Clin Nutr. 2016;103: 356-65. Yu D, Shu XO, Li H, et al. Dietary carbohydrate, refined grains, glycemic load, and risk of coronary heart disease in Chinese adults. Am J Epidemiol. 2013;178:1542-49. Gardner, CD, Trepanowski JF, Del Gobbo LC, et al. Effect of low-fat vs low-carbohydrate diet on 12-month weight loss in overweight adults and the association with genotype pattern or insulin secretion the diet fits randomized clinical trial. JAMA. 2018;319:667-79. Saslow LR, Daubenmier JJ, Moskowitz JT, et al. Twelve-month outcomes of a randomized trial of a moderate-carbohydrate versus very low-carbohydrate diet in overweight adults with type 2 diabetes mellitus or prediabetes. Nutr Diabetes. 2017;7;304. Feinman R, Pogozelski WK, Astrup A, et al. Dietary carbohydrate restriction as the first approach in diabetes management: Critical review and evidence base. Nutrition. 2015;35. Joshi SR, Bhansali A, Bajaj S, et al. Results from a dietary survey in an Indian T2DM population: a STARCH study. BMJ Open. 2014; 4:e005138. Narasimhan S, Nagrajan L, Kokila A, et al. Comparison of dietary profile of a rural south Indian population with the current dietary recommendations for prevention of non-communicable diseases (CURES 147). Indian J Med Res. 2016;144:112-19. Snorgaard O, Poulsen GM, Andersen HK, et al. Systematic review and meta-analysis of dietary carbohydrate restriction in patients with type 2 diabetes. BMJ Open Diabetes Res Care. 2017;5. Huntriss R, Campbell M, Bedwell C. The interpretation and effect of a low-carbohydrate diet in the management of type 2 diabetes: A systematic review and meta-analysis of randomised controlled trials. Eur J Clin Nutr. 2018;72:311-25. Seidelmann SB, Claggett B, Cheng S, et al. Dietary carbohydrate intake and mortality: A prospective cohort study and meta-analysis. Lancet. 2016;3:419-28. Turton JL, Raab R, Rooney KB. Low-carbohydrate diets for type 1 diabetes mellitus: A systematic review. PLoS One. 2018;13:e0194987. Miller V, Mente A, Dehghan M, et al. Fruit, vegetable, and legume intake, and cardiovascular disease and deaths in 18 countries (Prospective Urban Rural Epidemiology [PURE]): A prospective cohort study. Lancet. 2017;390:P2037-49. de Souza RJ, Mente A, Maroleanu A, et al. Intake of saturated and Trans unsaturated fatty acids and risk of all cause mortality, cardiovascular disease, and type 2 diabetes: Systematic review and meta-analysis of observational studies. BMJ. 2015;351:h3978. Burger KN, Beulens JW, Boer JM, et al. Dietary glycemic load and glycemic index and risk of coronary heart disease and stroke in Dutch men and women: The EPIC-MORGEN study. PLoS One. 2011;6:e25955. Iqbal R, Ajayan K, Bharathi AV, et al. Refinement and validation of an FFQ developed to estimate macro- and micronutrient intakes in a south Indian population. Public Health Nutr. 2009; 12:12-18. US Department of Agriculture, Agricultural Research Service, Nutrient Data Laboratory. USDA National Nutrient Database for Standard Reference, 2015. Priestley JH. The first sugar of photosynthesis, discussion upon photosynthesis in section C of the British association in the meeting held at Saskatoon, Canada. 1924;22.